Lancer Skincare present The Method: Polish & Glow: a three-step regime that works to refine, refresh and hydrate your complexion. Combining a gentle exfoliator, lightly-foaming cleanser and nourishing moisturiser, you can expect a younger-looking, smoother appearance with enhanced radiance. A gentle skin-resurfacing treatment formulated to improve skin tone and texture. Pure minerals are combined with magnesium oxide and sodium bicarbonate crystals to exfoliate the skin's surface, combating dullness, removing the build-up of debris and stimulating cell renewal for a refreshed, youthful-looking complexion. Fortified with pumpkin and pomegranate extracts, the anti-ageing polish works to break down dead skin cells, whilst brown sea algae replenishes moisture and boosts collagen production to reveal a smooth, supple complexion and healthy glow. A gentle, foaming cleanser formulated to eliminate debris and daily impurities, preparing skin for the application of further skincare products. Its rice amino acid complex is combined with hydrating and soothing ingredients to reveal a soft, smooth complexion and improved skin tone, without over-drying or uncomfortable tightness. Aloe vera stimulates cell renewal, whilst sodium PCA retains moisture to restore a healthy-looking glow. An anti-ageing moisturiser that utilises an oxygen-boosting complex to enhance the diffusion of oxygen and enrich the skin. Deeply hydrating, the treatment enhances the skin's ability to retain moisture, boosting cell metabolism and collagen production for a healthy, youthful glow. Its blend of beneficial peptides expertly decrease wrinkle depth and improve cell function, so skin looks smooth, supple and healthy. Expect nourished skin with renewed radiance. El método Lancer Skincare: Exfoliante: aplicar una pequeña cantidad sobre la piel húmeda y masajear delicadamente sobre el rostro y el cuello, evitando el área de los ojos. Aclarar con abundante agua. El método Lancer Skincare: Limpiador: aplicar una pequeña cantidad sobre la piel húmeda y masajear delicadamente sobre el rostro, el cuello y el escote, evitando el área de los ojos. Aclarar con abundante agua. El método Lancer Skincare: Hidratante: aplicar una pequeña cantidad sobre el rostro y el cuello dos veces al día después de la limpieza. 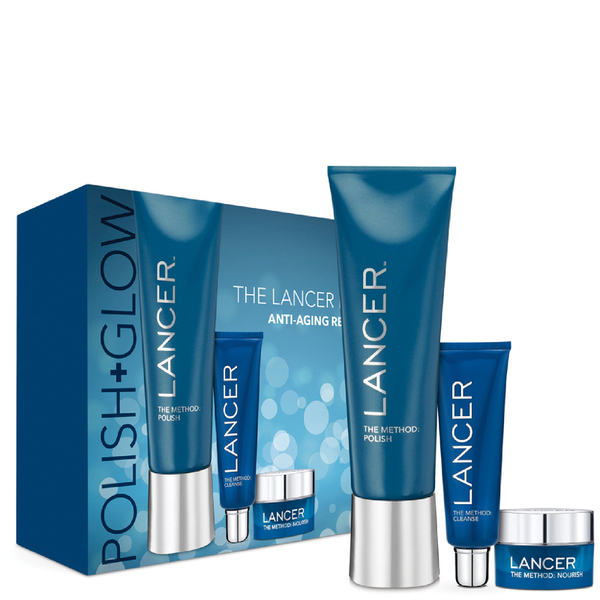 Lancer Skincare The Method: Polish: Butylene Glycol, Sodium Bicarbonate, Peg-8, Magnesium Oxide, Glycerin, Oleth-20, Trihydroxystearin, Glyceryl Stearate, Peg-100 Stearate, Silica, Alaria Escilenta Extract, Lactobacillus/Pumpkin Ferment Extract, Lactobacillus/Punica Granatim Fruit Ferment Extract, Helianthis Annus (Sunflower) Seed Oil, Leuconostoc/Radish Root Ferment Filtrate, Lavandula Angustifolia (Lavender) Oil, Tocopheryl Acetate, Retinyl Palmitate, Caprylic/Capric Triglyceride, Water (Aqua), Linalool. Lancer Skincare The Method: Cleanser: Water (Aqua), Sodium Laureth Sulfate, Cocamidopropyl Betaine, PPG-2 Hydroxyethyl Cocamide, Glycerin, Glycol Distearate, Aloe Barbadensis Leaf Juice, Yeast Amino Acids, Lavandula Angustifolia (Lavender) Oil, Hydrolyzed Rice Protein, Trehalose, Sodium PCA, Salicylic Acid, Inositol, Taurine, Urea, Betaine, Panthenol, Polyquaternium-4, Disodium EDTA, Citric Acid, Pentylene Glycol, Caprylyl Glycol, Phenoxyethanol, Chlorphenesin, Methylisothiazolinone, Methylchloroisothiazolinone, Potassium Sorbate, Fragrance (Parfum), Linalool. Lancer Skincare The Method: Nourish Moisturiser: Water (Aqua), Caprylic/Capric Triglyceride,Glycerin, C12-15 Alkyl Benzoate, Dimethicone, Butyrospermum Parkii (Shea) Butter, Squalane, Cetyl Alcohol, Glyceryl Stearate, Peg-100 Stearate, Stearic Acid, Dimethicone Crosspolymer, Cetyl Phosphate, Vitis Vinifera (Grape) Juice Extract, Tropaeolum Majus Extract, Persea Gratissima (Avocado) Oil, Olea Europaea (Olive) Fruit Oil, Hydrolyzed Rice Protein, Hexapeptide-48 Hcl, Dipotassium Glycyrrhizate, Sodium Hyaluronate Crosspolymer, Phytosterols, Raspberry Seed Oil/Tocopheryl Succinate Aminopropanediol Esters,Polyglyceryl-4 Diisostearate/Polyhydroxystearate/Sebacate, Carbomer, Ethylhexyl Stearate, Disodium Edta, Sodium Isostearate, Aminomethyl Propanol, Propanediol, Caprylyl Glycol, Chlorphenesin, Ethylhexylglycerin, Phenoxyethanol, Pentylene Glycol, Fragrance (Parfum), Limonene.